Adding to the laundry list of fascination new features being added to Super Smash Bros. for Wii U, the console title is getting “Big” versions of some stages that appear in the 3DS version. The prime example featured is the “big battlefield” stage, which showcases a larger general area, as well as more platforms for vertical spacing. 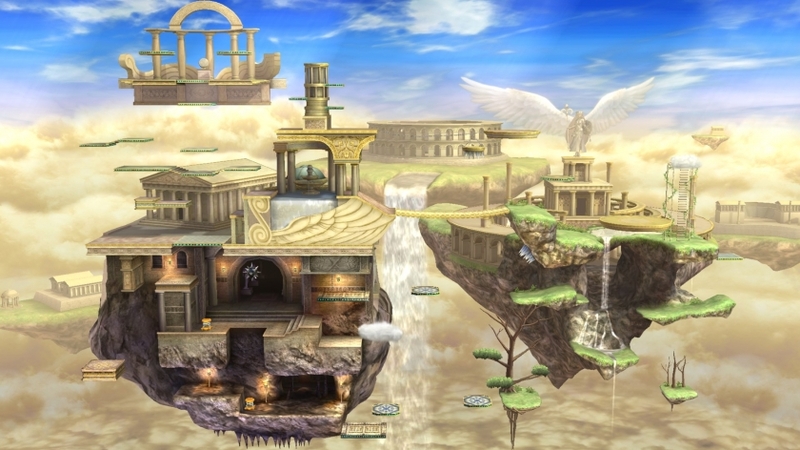 Additionally, it was noted in the Direct that stages, such as Palutena’s Temple, are pushing the limit of the stage sizes, going as far as to exceed the area of the renowned “Temple” stage from Melee. The reasons behind these stages are twofold; the Wii U version of this game appears on a much larger screen (unless your television happens to be unusually small, that is) and thus it is still fairly easy to see and identify characters, and these stages will help mitigate the chaos that is sure to ensue in the brand new 5-8 player smash modes. While battlefield was the only “big” stage showcased, players will be helped in choosing larger stages when attempting battles with more than four players, as the game will only allow one to choose from large enough stages? Has this approach changed your mind on large stages? I know of many who disliked them immensely in previous entries, but with a possibly maximum of eight players, it seems that these immense and epic stages may finally find a special niche for smash players.